Digitally controlled laser modes. Copyright Nature Publishing Group. Gordon Gould first coined the term laser — light amplification by stimulated emission of radiation — in 1959, but it wasn’t until 16 May 1960 that Theodore Maiman demonstrated the world’s first functioning laser, beating several research teams in the USA and Soviet Union. In the past five decades the now-ubiquitous laser has found its way into numerous devices, from printers and DVD players to barcode scanners and aircraft guidance systems. Despite remarkable advances in digital electronics during this period, the control of a laser’s beam shape — its spatial mode — has remained an analogue process. Until now, that is. Earlier this week, at a press conference in Pretoria, the world’s first digital laser was unveiled. Andrew Forbes, head of the Mathematical Optics Research Group at the Council for Scientific and Industrial Research (CSIR), described how he and his research team conceived and tested their breakthrough technology. 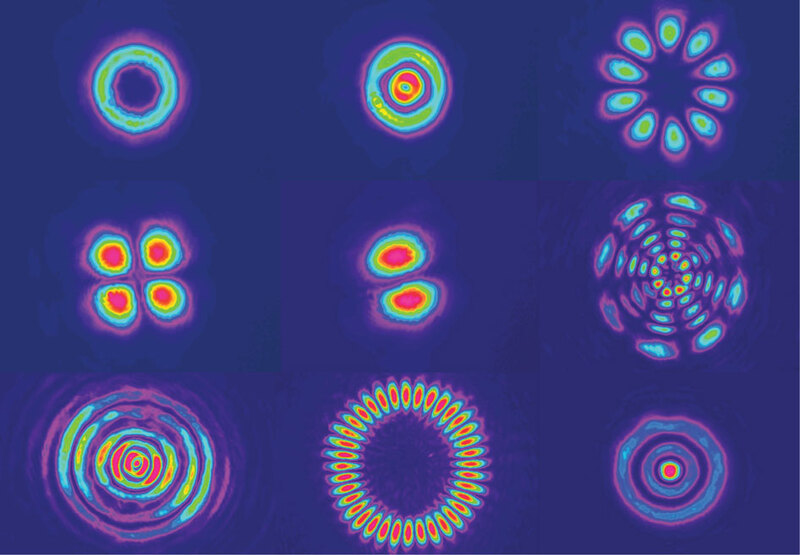 Their work appeared last month in Nature Communications and describes how they replaced one of the two mirrors in the laser with a digitally controlled liquid crystal display (LCD). The LCD acts as an intra-cavity holographic mirror, enabling the researchers to modify the laser’s spatial modes in real time (see image above left). Click here for a video showing how the pattern is dynamically changed. 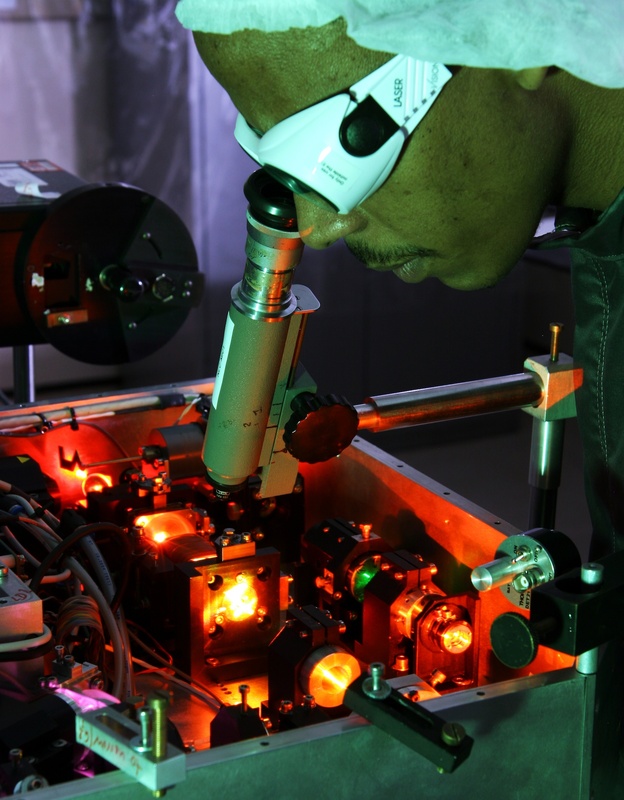 Doctoral student Sandile Ngcobo conducts a laser experiment. Courtesy of CSIR. Forbes commented that his team combines theory with practice: “What makes us unique is that we do both — maths and experiments.” He added, “Our device represents a new way of thinking about laser technology and we see it as a new platform on which future technologies may be built.” Working with Forbes is PhD student Sandile Ngcobo who conducted the experiments (see photo at right) and is enthusiastic about collaborating with scientists from America, Germany and Russia. Importantly, provisional patents were submitted well before the paper was published, with the intellectual property belonging to the CSIR. This then begs the question: Does this breakthrough technology have any potential in the field of medicine in general and breast cancer in particular? The answer is an unequivocal “yes.” Lasers are currently used in two different ways to treat cancer: to shrink or destroy a tumour with heat; and to destroy cancer cells by activating a chemical — known as a photosensitizing agent — in a process called photodynamic therapy. Laser energy delivered through a stereotactically-guided needle has successfully ablated small breast cancers. It’s encouraging to know that a South African invention will have a profound international impact in the future. Thanks for the link to this excellent review article, Ed. It’s interesting how science helps us to connect the dots!